Like every year, with an objective of lengthening the tourist season in Leh and to promote the cultural heritage of Ladakh, the four days Ladakh Festival is going to commence from September 22 to 25 in Leh. 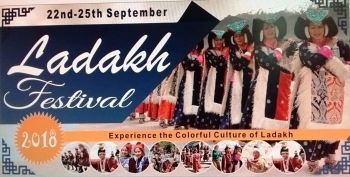 Ladakh Festival is jointly organised by LAHDC, Leh and J&K Tourism Department. Villagers from Nubra, Changthang, central Ladakh and Shaam regions will come in their traditional attire to participate in the 4 days Ladakh festival. As per past practice, this year also Ladakh Festival will begin with a colourful procession of cultural troupes from all part of the district and school children performing on traditional musical orchestra starting from Karzoo through Leh market that finally ends at Polo-ground, Leh. The concluding function of Ladakh Festival will be held on September 25 in Leh market near Masjid followed by music concert at 6 pm. During Ladakh Festival all the government employees have been asked to come in traditional dress and general public is also requested to wear traditional attire during the festival. It is a day for every Ladakhi and specially for tourists to experience and enjoy the cultural richness of Ladakhi tradition at one place during the festival.